This 2019, what are your roofing options for flat roofs? Times are changing. Hence, you need to find roofing systems that would work for you and your business. It’s not enough that you know what’s out there but you should be able to discern what you need that’s aligned with your personal goals and plans. We’re getting a bit serious here because there are endless roofing options for flat roofs but how will you know if it’s the right choice? There are different opinions, suggestions, and claims, but which voice should you listen to? Flat roofing is common among commercial and industrial properties/facilities because of its functionality. And besides, you don’t really need a pitched roof for that purpose. Furthermore, flat roofs offer an added space that can be useful for the building owner. More than the design, you’re after its flexibility. 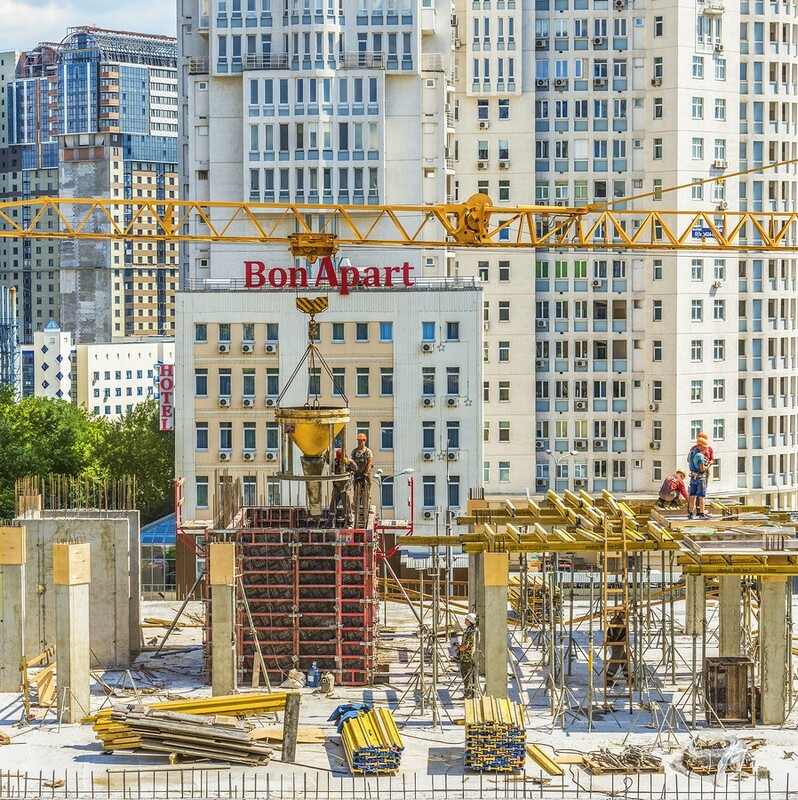 You need an area that could easily be accessed by workers for regular maintenance and inspections. 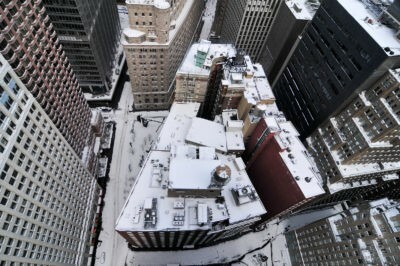 Hence, low slope roofing is really the go-to for commercial use. Flat roofing is used for commercial and industrial facilities for it offers enough space to accommodate necessary elements. 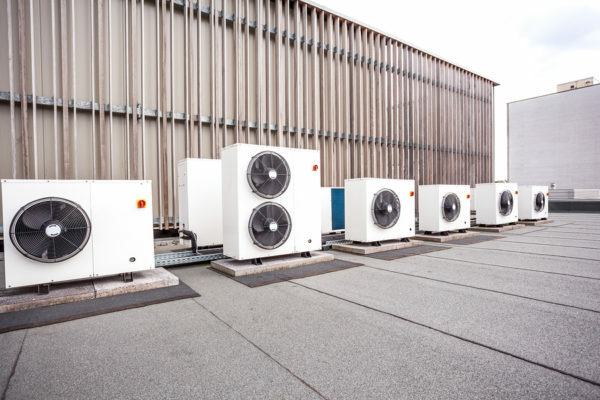 In this photo, you’ll notice that there are many cooling equipment that you cannot place on a pitched roof. How to Choose a Flat Roofing System? As we’ve mentioned above, there are too many commercial roofing options for flat roofs. Sometimes it can get confusing and, of course, you don’t want to make a mistake. Otherwise, you’re just wasting your time and investments — something that a business owner couldn’t afford to do so. To avoid this from happening, here’s what you need to know. Commercial flat roof materials are divided into three main categories. There. It sounds simpler if you’ll group them this way. You can look under each category to see what options are best for you this 2019. If it’s traditional, it doesn’t mean it wouldn’t work in the modern times. They’re known as the traditional types because of their origins. They have been developed way back in the early 20th century which also means that they’ve been used for so many years now. Because of this, they bring unbeatable track record in the roofing industry. Something that you couldn’t underestimate even if there are newer roofing systems. A BUR is produced from stacking layers of tar along with other materials. The last layer is coated with either stone or gravel to seal the membranes in place. Its number one positive quality is its affordability. Prices can start at $4 per square foot which is really cost-efficient. In an average, a BUR lasts for 20 to 25 years but could go up all the way to 40 long years given the right maintenance. It is also known to be durable and weather-resistant. When it comes to the negatives, you have to know that BUR is difficult to install. The installation process is complicated because materials are melted and poured over the roofing surface. It’s tricky and would definitely require the right skills. Mastic asphalt (MA) is produced from limestone aggregate that’s also mixed with bitumen. This is one of the oldest flat roofing materials still present today. In fact, it’s also popular in constructions outside roofing like large-scale road and bridge projects, parks, among others. MA is long-lasting as it can last for up to 50 years. The only thing to note from the beginning is that it can also be complicated to install. Workers need to create reinforced joints as part of the installation process and this could take a while affecting the labor costs. Modified Bitumen is a combination of different elements including fiberglass, asphalt, and some synthetic polyester material. It has great waterproofing and insulating capabilities on top of its flexibility. While it’s known to be durable and weather-resistant, it can be prone to mold and algae growth if not monitored correctly. This traditional roofing system has an average lifespan of 20 to 30 years which is not bad if you’re considering this for your business (especially if you have plans to relocate or expand). As a lightweight roofing system, metal doesn’t have too many structural demands unlike the traditional roofing options for flat roofs. This is one of the top-of-mind choices for commercial roofing because it’s easy to install. It also has a wide color selection if you’re eyeing for a certain look. 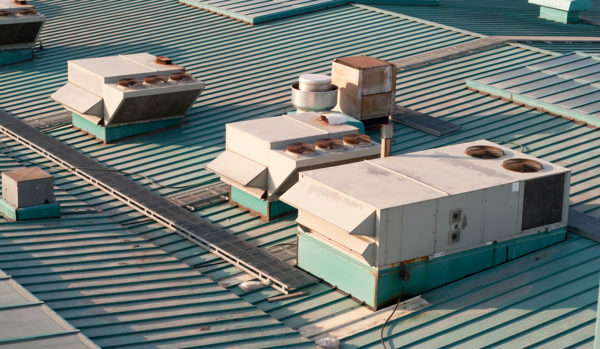 This is an example of a metal flat roofing that has air vents on top of it. Aluminum – This is on the expensive side because it can cost $800 and above per square foot. The amount is compensated by its longevity as it can serve you for more than 50 years (which is a really long time). This is ideal for business owners who have long-term plans for their properties. Aside from excellent insulation properties, it is also durable and weather-resistant as it doesn’t crack or burn. Steel – This is your affordable option as it only costs $12 per square foot — significantly lower than aluminum’s pricing. Despite the price difference, it’s still a great option because it also has good insulation properties. 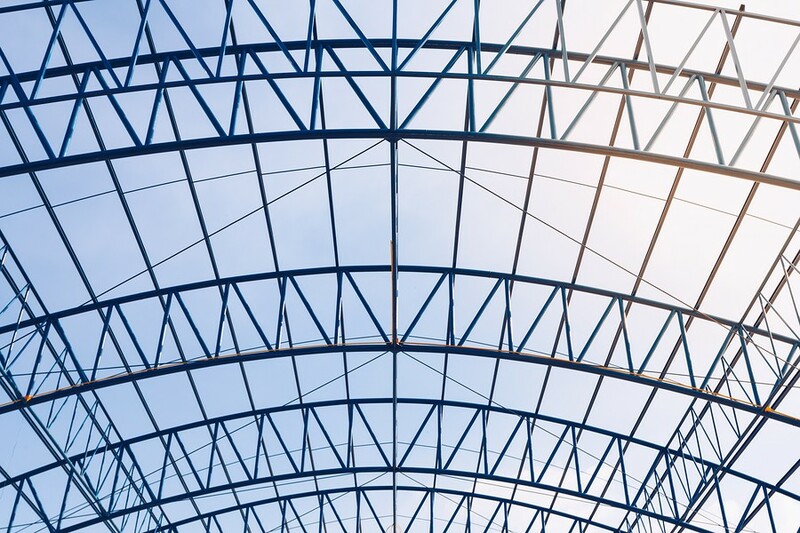 Steel has superior strength as well that can resist extreme weather conditions. These synthetic or single-ply membranes are newer to the market. While they’ve also been around for years now, not everyone has come to understand what they are and what they can do. If you want to know what other roofing options for flat roofs are out there for you, read on below. TPO has airtight-sealed corners that effectively prevent moisture penetration. Hence, it’s a great waterproofing material. Moreover, it is also fire-retardant and durable. It has an average lifespan of 20 to 30 years. If you’re looking for an eco-friendly and sustainable roofing solution, you can go for TPO because it can reflect UV rays. Despite its energy-efficient qualities, it only costs $5 to $6 per square foot. A PVC flat roof is known for its superior durability. In fact, harmful chemicals and external pollutants are no match to its power. You can also add affordability to its positive qualities because you can purchase them at about $5 to $6 per square foot. An EPM rubber flat roof (ethylene propylene diene monomer) is also a waterproof roofing membrane. Some people like it because it can last for many years and is only available for $0.80 per square foot. According to experts, this has the tendency to show premature signs of deterioration if not installed correctly. Hence, you always have to make sure that you’re working with a licensed and experienced roofing company that specializes in single-ply membrane installation. There you have it, your top roofing options for flat roofs this 2019. You can always go back to this list to help you narrow down the decision making process. Remember, there are three main categories that divide them. This helps streamline the way you think so you wouldn’t get drowned with too many choices. Above anything else, it’s extremely important to find a roofing company that can guide you through the process. Aside from the commercial roofing options for flat roofs, there are several other things to include in the formula. To know more about this, feel free to discuss with J&M Roofing LLC’s representatives. You can also check out some of our clients’ roofing success stories. We’re a licensed Ohio-based roofing contractor that’s committed to the growth of your business. Want to learn some more about commercial roofing and how to use it to your advantage? Call us today: 877-480-8860. The first consultation is always free of charge. What are you waiting for? Schedule an appointment with our team.